Have you ever wanted to see all the digital photos and other images without opening each up individually (one after another)? Able Photo Slide Show displays your images in a folder continuously without your doing anything (Slide Show). You just point it to a folder, designate, how long to display each picture, select transition effects and then sit back and watch. If a picture is too large or less for your screen, it is resized to fit keeping the aspect ratio.It can also create standalone slide shows and screen savers and save captions inside JPEG, TIFF, TGA, GIF and others photos. Load up multiple formats of images including tif, tiff, fax, gif, jpg, jpeg, jpe, pcx, bmp, dib, rle, ico, cur, png, wmf, emf, tga, targa, vda, icb, vst, pix, pxm, ppm, pgm, pbm. View the slide show with 150 transitional effects (with preview), full screen mode, hide cursor on full screen mode and preview the images while loading up the list. Project manager: adding and removing files in project from any folders (with preview), multiple file selection (you can hold SHIFT down and select a range, or hold CTRL down and select multiple photos). Opening and saving projects. 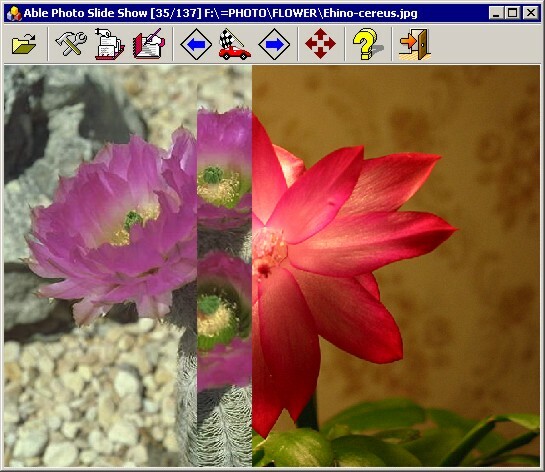 Able Photo Slide Show Software allows you to create standalone executable slide shows and screen savers. Description Manager: Addition and viewing of the graphic files description, the information is stored directly in files with JPG, JPEG, JPE, TIF, TIFF, FAX, G3N, G3F, TGA, TARGA, VDA, ICB, VST, PIX, GIF, PXM, PPM, PGM, PBM extension. You would not need to worry about different image dimensions or file type as Able Photo Slide Show would resample the images on-the-fly prior to loading them up on screen and you will get perfectly centered images each time. The number of images is shown in the upper part of the window (when the first image out of 16 is displayed, it reads 1/16). 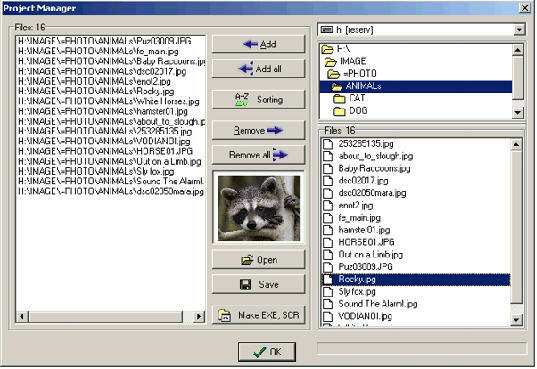 The panel for display of the files description, slide show Auto-start, start and Stop buttons, viewing selected items or all items in the folder (and subfolder). 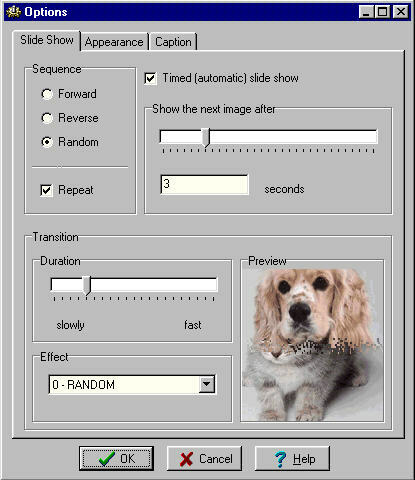 Sequence options (forward, reverse, and random). Repeat slide show option.Slide delay adjustment. Background color or images selection.Transition delay adjustment, transition delay adjustment. HotKey buttons (Front, Back, Stop, Start, Caption panel, Exit from full screen mode). Sound Playback WAV, MID and MP3 (only if in system installed MP3 codec) files. PSSP (Photo Slide Show Project) extension associated with program, launching from command line (folders, files or projects).The command line parameter ("/splash", "/exit", "/fullscr"). Program context menu in Explorer. Algolab Raster to Vector Conversion - Convert Raster to Vector. Animated GIF Banner Maker - Easy make Animated GIF Banner. AVerRC - Remote controlling multimedia applications! I photo DVD - Convert Photo to DVD VCD, Create your own VCD and DVD photo slide show and DVD Photo album with transitions and music! Hot ! Plato Photo Slideshow - Help you create an exciting photo slide show with background music, subtitle, and transition effects . All My Movies - Easy to use movie database manager. Able Photo Slide Show - Make photo slide show software. AyeView - Image viewer, converter and browser runs on Windows. Blaze MediaConvert - All-in-one Graphic Video Music Conveter. Blaze Media Pro- All-in-one media converter, editor, player. ChrisTV Professional - The Best way to control your TV Card.